The first row of an afghan with homespun or bouclé or other knobby style yarn can be frustrating. This afghan does not require finding chain stitches, even for the first row. The lacy strawberries and shells keep the afghan light even with a heavier yarn. The example is made in Yarn Bee Boucle Traditions. There is also a video and a chart available for this pattern. Row 1: Ch 3, tr in first ch, (ch 3, tr in last ch sp) until you have made desired number of tr/ch spaces. Make a number of them that is a multiple of 4 plus 1. Row 2: Ch 4. Without turning the work, make 2 dc over tr just made. Working across the tr stitches, ch 1, skip 1 tr, SB over next tr, ch 1, skip 1 tr ** Shell over next tr, ch 1, skip 1 tr, SB over next tr, ch 1, skip 1 tr. Repeat from ** across to the last tr stitch. Work (2 dc, ch 1, 1 dc) over last tr. Row 3: Ch 4 and turn. 2 dc in ch-1 sp, ch 1, skip ch-1 space between dc and SB, sc in first ch-1 sp of SB, (ch 3, sc in next ch-1 sp) three times, ch 1, skip ch-1 sp between SB and Shell, ** Shell in next Shell, ch 1, skip ch-1 space between Shell and SB, sc in first ch-1 sp of SB, (ch 3, sc in next ch-1 sp) three times, ch 1, skip ch-1 sp between SB and Shell. Repeat from ** across to ch-4 turning chain. (2 dc, ch 1, dc) in ch-4 sp. Row 4: Ch 4 and turn. 2 dc in ch-1 sp, ch 2, skip ch-1 space between dc and strawberry, sc in first ch-3 sp, (ch 3, sc in next ch-3 sp) two times, ch 2, skip ch-1 sp between strawberry and Shell, ** Shell in next Shell, ch 2, skip ch-1 space between Shell and strawberry, sc in first ch-3 sp of strawberry, (ch 3, sc in next ch-3 sp) two times, ch 2, skip ch-1 sp between strawberry and Shell. Repeat from ** across to ch-4 turning chain. (2 dc, ch 1, dc) in ch-4 sp. Row 5: Ch 4 and turn. 2 dc in ch-1 sp, ch 3, skip ch-2 space between dc and strawberry, sc in first ch-3 sp, ch 3, sc in next ch-3 sp, ch 3, skip ch-2 sp between strawberry and Shell, ** Shell in next Shell, ch 3, skip ch-2 space between Shell and strawberry, sc in first ch-3 sp of strawberry, ch 3, sc in next ch-3 sp, ch 3, skip ch-2 sp between strawberry and Shell. Repeat from ** across to ch-4 turning chain. (2 dc, ch 1, dc) in ch-4 sp. Row 6: Ch 4 and turn. 2 dc in ch-1 sp, ch 3, skip ch-3 space between dc and strawberry, (tr, ch 3, tr) in ch-3 sp, ch 3, skip ch-3 sp between strawberry and Shell, ** Shell in next Shell, ch 3, skip ch-3 space between Shell and strawberry, (tr, ch 3, tr) in ch-3 sp of strawberry, ch 3, skip ch-3 sp between strawberry and Shell. Repeat from ** across to ch-4 turning chain. (2 dc, ch 1, dc) in ch-4 sp. Row 7: Ch 4 and turn. 2 dc in ch-1 sp, ch 1, skip ch-3 space between dc and strawberry, SB in ch-3 sp, ch 1, skip ch-3 sp between strawberry and Shell, ** Shell in next Shell, ch 1, skip ch-3 space between Shell and strawberry, SB in ch-3 sp of strawberry, ch 1, skip ch-3 sp between strawberry and Shell. Repeat from ** across to ch-4 turning chain. (2 dc, ch 1, dc) in ch-4 sp. Repeat row 3 to 7 until afghan is desired length. Finish off and weave in end. To add this optional border, continue the main blanket ending with a row 6, except making a ch 2 instead of a ch 1 in the last partial shell of the row. Border round 1 – continuing from the row 6, (dc, ch 2, shell) in that same ch-4 turing chain. Continue working down the side of the blanket in spaces created by the ch-4s at the beginning of rows and the dc at the end of rows. Ch 3, dc in the next space, ch 3, dc in the next space, ch 3, skip a space, shell in the next space, ** ch 3, skip a space, dc in the next space, ch 3, dc in the next space, ch 3, skip a space, shell in the next space. Repeat from ** down the side of the blanket. The last shell will be in the first chain loop at the bottom of the blanket. (ch 2, shell) in this same space. Continuing across the loop spaces at the bottom of the blanket, *** ch 3, skip a space, (dc, ch 3 dc) in next space, ch 3, skip a space, shell in next space. Repeat from *** across bottom of blanket. Last shell will be in the last loop space at the bottom of the blanket. (ch 2, shell) in this same space. Continue working down the other side of the blanket in spaces created by the ch-4s at the beginning of rows and the dc at the end of rows. Ch 3, skip a space, dc in the next space, ch 3, dc in the next space, ch 3, **** skip a space, shell in next space, ch 3, skip a space, dc in the next space, ch 3, dc in the next space, ch 3. Repeat from **** across to end of the side. (shell, ch 2, dc) in the last side dc space. Sl st to join to the third ch of the beginning of the last row of the blanket. Border round 2 – Sl st into ch sp. Ch 3, (dc, ch 2, 2 dc) in same ch sp, ** ch 1, skip ch-3 space, SB in next ch-3 sp, ch 1, skip next ch-3 sp, Shell in next Shell. Repeat from ** across to corner, shell in ch-2 space between shells, [shell in next shell, *** ch 1, skip ch-3 space, SB in next ch-3 sp, ch 1, skip next ch-3 sp, Shell in next Shell. Repeat from *** across to corner, shell in ch-2 space between shells] three times. Sl st to join to the 3rd ch at the beginning of the round. Border round 3 – Sl st in dc, sl st in ch-2 sp, ch 3, (dc, ch 2, 2 dc) in same ch sp, ** ch 1, skip ch-1 space between dc and SB, sc in first ch-1 sp of SB, (ch 3, sc in next ch-1 sp) three times, ch 1, skip ch-1 sp between SB and Shell, Shell in next Shell. Repeat from ** across to corner, ch 2, shell in corner shell, ch 2, [shell in next shell, *** ch 1, skip ch-1 space between dc and SB, sc in first ch-1 sp of SB, (ch 3, sc in next ch-1 sp) three times, ch 1, skip ch-1 sp between SB and Shell, Shell in next Shell. Repeat from *** across to corner, ch 2, shell in corner shell, ch 2, shell in next shell, ch 2] three times. Sl st to join to the 3rd ch at the beginning of the round. Border round 4 – Sl st in dc, sl st in ch-2 sp, ch 3, (dc, ch 2, 2 dc) in same ch sp, **ch 2, skip ch-1 space between dc and strawberry, sc in first ch-3 sp, (ch 3, sc in next ch-3 sp) two times, ch 2, skip ch-1 sp between strawberry and Shell, Shell in next Shell, Repeat from ** across to corner, ch 2, 2 dc in ch-2 sp, ch 2, shell in corner shell, ch 2, 2 dc in ch-2 sp, ch 2, [shell in next shell, ***ch 2, skip ch-1 space between dc and strawberry, sc in first ch-3 sp, (ch 3, sc in next ch-3 sp) two times, ch 2, skip ch-1 sp between strawberry and Shell, Shell in next Shell, Repeat from *** across to corner, ch 2, 2 dc in ch-2 sp, ch 2, shell in corner shell, ch 2, 2 dc in ch-2 sp, ch 2 ] three times. Sl st to join to the 3rd ch at the beginning of the round. Border round 5 – Sl st in dc, sl st in ch-2 sp, ch 3, (dc, ch 2, 2 dc) in same ch sp, **ch 3, skip ch-2 space between dc and strawberry, sc in first ch-3 sp, ch 3, sc in next ch-3 sp, ch 3, skip ch-2 sp between strawberry and Shell, Shell in next Shell, Repeat from ** across to corner, (ch 2, 2 dc in ch-2 sp) twice, ch 2, shell in corner shell, ch 2, 2 dc in ch-2 sp, ch 2, [shell in next shell, ***ch 3, skip ch-2 space between dc and strawberry, sc in first ch-3 sp, ch 3, sc in next ch-3 sp, ch 3, skip ch-2 sp between strawberry and Shell, Shell in next Shell, Repeat from *** across to corner, (ch 2, 2 dc in ch-2 sp) twice, ch 2, shell in corner shell, ch 2, 2 dc in ch-2 sp, ch 2] three times. Sl st to join to the 3rd ch at the beginning of the round. Finish off and weave in end. Love having an afghan pattern geared to Homespun Yarn. Have a good amount of it in my stash and will put it to work. Thanks. It would make a great scarf. It can be made by starting with 5, 9 or 13 chain loops depending on the width you’d like. Each chain loop will be about an inch in width. Used a pattern of yours for a shawl. Love it!! Very pretty. I have lots of Homespun in my stash! Do you have any graphs for the no beginning chain afghans? I haven’t made charts for those but can work on doing that. Here is a chart for the Strawberry Lace. I would be glad to work on them in the order you’d be interested in having them if you let me know. This graph is excellent. It saved me from having to draw it out myself. Thanks. Any chance of a video for this one? I’m fairly new to crochet, and I do much better with videos than written instructions. Thanks for posting all the easy patterns for bouclé. I bought some not realizing it would be harder to work with, and was getting frustrated trying different patterns. I’m so glad I stumbled across your site! The only ways I currently have available to follow my blog is by RSS feed and the blog’s twitter account on which I tweet with new patterns. We are in the process of updating the blog to add various features. I’d love your suggestions about how you would like to follow the blog. THANK YOU, THANK YOU, THANK YOU. I HATE WORKING WITH HOMESPUN BECAUSE IT’S SO HARD TO FIND THE STITCHES, BUT THIS IS SO EASY AND PRETTY. THANKS FOR SHARING THIS PATTERN. Thanks! I have boucle yarn and looking forward to trying this!! Thank you so much for the video. I am new at this, and I have such a hard time with patterns. Watching your video which was so clear made this much easier to understand. Is it possible to make any afghan using the “no beginning chain” technique? Or for that matter! any crochet pattern. When I convert traditional stitch patterns to a “No Beginning Chain” blanket, I like to start with a stitch pattern that either has all stitches made in chain spaces, or can be made that way with slight modification. Most stitch patterns, even if the main portion is made in chain spaces, have edges with stitches made in stitches. 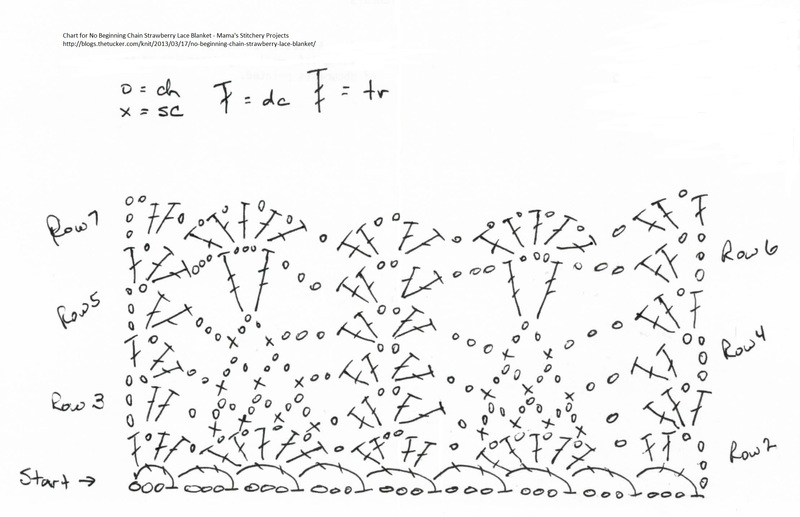 I convert the edges to stitches made in chain spaces. For the beginning chain, based on the repeat of the pattern and spacing of the first row stitches, I determine the best foundation chain loops to use. 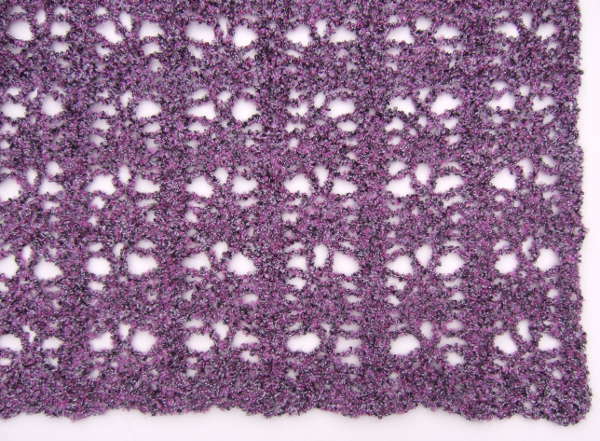 This pattern would make a beautiful shawl. I agree, in fact I have started one using 17 ch- tr for the width. I just hope I have enough yarn! I’m using an olefin yarn, 4 ply so old that the price is only $.49 for a 1.75 oz skein. There’s 108 yds per skein and I have 5 skeins so keeping my fingers crossed! i really loved this pattern the video was helpful in getting started i used lilly surgar and cream yarn and made a great table runner.may use this pattern to make a afgan in the future. thanks. I love this pattern. I crochet left handed and for the life of me can not figure out how to work back across the row without turning it. Will turning it ruin the pattern or is there another way to do this? Think about when you make a beginning chain. When you make a beginning chain you don’t have to turn it to then start across making your row. This works exactly the same way. That pattern has a lot of lace effect in it. It should take shape after more rows. If it doesn’t look like it is correcting, feel free to send me a picture and I will have a better idea of what is happening. I love this! I made a scarf with some leftover yarn to practice and it was fun to do. It works up quickly. I’m starting a double bed sized afghan, I’m using Loops & Threads Impeccable (Fresh Lilac colour…it’s going to be so pretty!) and it recommends a #5 hook. I’ve done the 61 loops to start as per your size chart but I’d like to go a little wider. I’m not very advanced in crochet and I may have missed this info, but how many loops more can I add to repeat the pattern? Your videos are wonderful. I’m also doing a scart using the basket stitch pattern you provide. So helpful to see how it’s done when you aren’t yet able to easily read a pattern. Duh, found it…a multiple of 4, plus 1. So I can just add multiples of 4 onto the 61 until I think it’s wide enough. A-ha! Hi there… I have a quick question. I’m in the middle of making this afghan and was wondering at the very end, do I just finish it off with row 7? Should I do something else at the end to make it look more like a border? The first row looks great!! Love all your patterns. I’m working the No Beginning Chain Strawberry Lace Blanket in a soft cotton. I just love how it’s turning out!! Please advise on the last row! Thank you! I would recommending stopping with a row 6. There isn’t a perfect way to make the top just like the bottom, but one thing you could do would have one loop less than the bottom. You could make ch-3 loops and sc in each ch-3 and ch-2 space across the top. That would be the closest approximation to the beginning row. Thank you! Sounds like a great plan!! Love all your videos and patterns! I’ve added the optional border instructions to the bottom of the pattern. Question about row 5 — aren’t we supposed to SC in the 3rd ch-3 space of the SB’s creating two ch-3 loops over the 3 ch-3 loops we created in the SB’s in row 4? Or are we to leave the 2nd and 3rd ch-3 loops of the SB on row 4 unworked? Thanks! PS – first time I’ve tried your “no chain row” method – I love it. I just watched the video and confirmed my suspicions. That helped a lot. But you might want to update the patten instructions for row 5. I’m sorry – I had my rows confused. The pattern is fine. My mistake. I am making a bed spread with this pattern using thread size 10. I have worked on it for 2 1/2 months and am up to 53 1/2 inches. It is beautiful in crochet thread! I made a shade for my sewing room & i like thw pattern very much & i am learning new things. I’m absolutely loving making this. I’m doing the large size afhhan in Lion brand homespun, colour Barrington with random ripples of Tudor. This is my first homespun project and I was expecting a struggle but have had no trouble working with it at all. Love the pattern, thank you! I am just finishing up this blanket (and it looks lovely!) but am unsure about the border… Am I reading the pattern correctly that Round 1 of the border ends after only 3 of 4 sides? And then the remaining rounds go around all 4 sides? Thanks for clarifying!! Correct. Basically the last row you complete on the main blanket is the first side boarder row, so you will continue around the side, bottom and other side for that first boarder row. Do you have a video of the optional border? I have a question. Started this beautiful blanket but on row 4 it says to ch3, sc in next ch-3 sp two times. Shouldn’t it be 3 times like in row 3? I tried doing it 2 times but the work pulls like there are stitches missing. Please advise. Waiting to continue. Each row will have one fewer loop so that it makes the resulting triangular shape. It doesn’t look like it will work while you are on that row, but a few rows past it the stitches are stretched toward the added rows and it will look great. I love this pattern! Thanks so much! I am having trouble with the last part of the first round of the border and the first part of round 2. The other corners have 2 shells separated by 2 ch. It looks nice. When I get to the last corner it doesn’t look the same. When I get to the end of round 1 of the border I placed the (shell, ch2, dc) in the side of the row BEFORE the first ch 4 space. Then I put the sl st in the 3rd of the 4 chains. Then I continued with the first instructions for the 2nd round (Sl st into ch sp. Ch 3, (dc, ch 2, 2 dc) in same ch sp). I’m pretty sure I’m working in the right spaces because once around the corner the rest of the first side is like row 7 of the body. But that last corner just doesn’t look right. Any help you can provide would be much appreciated! I can send a picture if it would help. That would be great if you could send a picture. I’m sure we can figure it out. I am new to the crochet world but this pattern is beautiful! Thank uou for designing it because I love using the ripple yarns. I got a whole bunch (16) of skeins last year when my local Micheals did a clearance of discontinued LionBrand homespun. I have made only one blanket so far but I cant wait to make one with this pattern. I am making curtain panels for a poster bed . I am having difficulty with the border directions. “Border round1″ seems to only give directions for 3 sides. I repeated the directions for the bottom, which I thought would be fine. Am I ok with doing that? The border round 1 uses the last row (a row 6) of the main blanket as the first side (top) of the border, so the directions after that are for the other three sides. Thank you helping me to make a strawberry & shell, know i remember but been long time.